A new analysis based on a theoretical decision-making model found that the threshold for starting antiepileptic drug treatment for a first unprovoked seizure may be lower than what is suggested in guidelines from the International League Against Epilepsy, suggesting that it is not necessary to treat all unprovoked first seizures. A broader range of adult patients with a first unprovoked seizure could benefit from immediate treatment with an antiepileptic drug (AED) rather than waiting to see if the problem recurs, according to a new analysis based on a decision-making model. Whether to begin AED therapy in the aftermath of a first seizure with no obvious cause can be a tough call for doctors and patients, who must weigh the risk of another seizure versus the potential side effects of AEDs. The analysis is theoretical and not based on a clinical trial, and thus should be “taken in the proper context,” noted an accompanying editorial in same issue of Neurology. “Nonetheless, the overarching conclusion of this decision analysis is likely correct, namely that early treatment may be favorable over a larger number of clinical situations,” wrote Claire Jacobs, MD, PhD, and Jong Woo Lee, MD, PhD, of Brigham and Women's Hospital. The study's senior author, M. Brandon Westover, MD, PhD, associate professor of neurology at Harvard Medical School and MGH, said the study began as part of a project in a course about “probabilistic medical decision modeling” that he taught with co-senior author Matt Bianchi, MD, PhD. The study's first authors were Erik Bao, Ling-Ya Chao and Peiyun Ni, who were students in the course. The study authors noted that initiating or withholding AED therapy treatment after a single unprovoked seizure has been a longstanding topic of debate. In the first case, a 30-year-old man with no identifiable neurologic conditions, history of seizures, AED use, depression, anxiety or comorbidities had a normal magnetic resonance image (MRI) and electroencephalogram (EEG). He lacked any other identifiable risk factors for recurrent seizures, suggesting a low risk for recurrent seizures. If seizures did recur, the study authors noted, they would likely substantially reduce QOL. The patients did not meet the ILAE definition of epilepsy (10-year recurrence rate of under 60 percent). In this case, the decision model favored immediate AED treatment, even though the patient fell below the 60 percent risk threshold in the ILAE guidelines, the study authors found. Immediate treatment would result in 19.04 QALYs compared to 18.65 QALYs if treatment was deferred until a second seizure occurred. In the second case, a 30-year old women's MRI showed hippocampal atrophy, consistent with mesial temporal sclerosis as a focal point of epilepsy. MRI indicated the patient has greater than 60 percent chance of recurrent seizures and would have substantially reduced QOL as a result. The woman meets the ILAE definition of epilepsy. The decision model favors immediate treatment, the same approach that would be followed under the ILAE guidelines. The model found that immediate treatment would result in 15.23 QALYs compared to 14.75 QALYs with deferred treatment. In the third case, a 60-year old woman in a wheelchair (indicating lower risk of falls) has focal seizures (right arm twitching) rather than generalized convulsions. The patient has a high risk of recurrence and meets the definition of epilepsy, suggesting treatment is justified, but is also at high risk of adverse effects from AED therapy. There would be a small reduction in QOL should another seizure occur. The decision model prefers deferred AED therapy over immediate treatment, though by a small margin (10.89 QALYs versus 10.79 QALYs). The decision-making model outlined had limitations, the authors acknowledged. It used data drawn from previously published research to do the calculations and focused only on adults, not children. Also, QOL is hard to quantify. The model is not ready for clinical use, though Dr. Westover and his team are working to develop a web-based app that doctors and patients could use together to help make a decision about starting or deferring treatment. “At the very least, this study should, however subtly, shift the starting point of discussion with the patient toward a default of immediate, rather than deferred, treatment after a first unprovoked seizure and apparent absence of disease,” the editorial said. Dr. Hirsch said the assumptions that led to deferring treatment in the third case involving an older patient assumed to have high risk of permanent AED side effects “are dubious.” Still, he said the report is a reminder to clinicians considering whether to initiate drug therapy to “include not only the risk of having another seizure, but also the effect of seizure recurrence on the patient, such as the impact on driving, work, and the risk of sudden unexpected death in epilepsy.” Other things to consider, he added, include the efficacy of AEDs (since they do not cut the risk of recurrence down to zero) and possible side effects of AEDs (though most are mild-moderate and reversible). All of these issues will vary from patient to patient, he pointed out. Dr. French said she urges patients to not view a decision to begin an AED as set in stone. “If you want to try a drug, you are not marrying it, just dating it. If it turns out to be a terrible decision, you still have the opportunity to kick it to the curb,” she said. Dr. French served on a joint committee of the American Academy of Neurology and the American Epilepsy Society that wrote 2015 guidelines for management of an unprovoked first seizure in adults, which stress there is not a one-size fits all approach. “Making the decision to take an AED to prevent a recurrent seizure is not the same as saying someone has a diagnosis of epilepsy,” she said. He said the decision model underscores the need to design well-stratified clinical trials to compare early treatment versus non-treatment separately in each of the three suggested types of patients, rather than grouping all patients together to examine the question. In everyday practice, the decision to start an antiseizure drug “requires shared decision-making between the doctor and patient,” Dr. Bleck said. For some patients, the risk of losing their driver's license in the event of another seizure may be all that matters because of their occupation, while other aren't dependent on driving. Dr. Bleck, who prefers the term antiseizure medication rather than antiepileptic, which he said reflects less bias, noted that patients also vary in their willingness to tolerate drug side effects. Dr. Bleck said a thorough neurologic exam, in addition to an MRI and EEG to rule out detectable abnormalities, is critical to deciding whether antiseizure therapy may be warranted. The study was funded by the National Institute of Neurological Disorders and Stroke (NINDS). The study authors reported no relevant disclosures. Dr. Jacobs is partially supported (80 percent) by the NINDS and is an inventor on two patents related to the synthesis and use of DNA-binding small molecules targeted to transcription factor binding sites (patent US 7,935,530 B2; November 28, 2007; patent US 9,630,950; April 25, 2017). Dr. Lee has served on the scientific advisory board of Lundbeck, serves on the editorial board of Epilepsy Currents, has completed contract work for SleepMed/DigiTrace and Advance Medical, and has received prior funding from the NINDS. Drs. Bleck and Hirsch reported no relevant disclosures. Dr. French is a scientific officer for the Epilepsy Foundation and serves on the Epilepsy Study Consortium for which NYU receives salary support for her work. She consults for multiple pharmaceutical companies, including Acadia, Adamas, Addex, Aeonian, Alexza, Anavex, Axcella Health, Biogen, Biomotiv, Blackfynn, Bloom Science, Bridge Valley Ventures, Cavion, Cerebral Therapeutics, Clinilabs, Concert Pharmaceuticals, Covance, CuroNZ, Eisai, Empatica, Engage Therapeutics, Epitel, GSK, GW Pharma, Idorsia, Impax, Ionis, J&J Pharmaceuticals, Marinus, MonosolRx, Neurelis, Novartis, Otsuka Pharmaceutical Development, Ovid Therapeutics Inc., Pfizer, Pfizer-Neusentis, Redpin, Sage, Sancillio, Shire, SK Life Sciences, Springworks, Stoke, Sunovion, Takeda, UCB Inc., Ultragenyx, Upsher Smith, Vyera, Xenon, Xeris, Zogenix, and Zynerba. Dr. French is on the editorial board of Lancet Neurology and Neurology Today. •. Bao EL, Chao LY, Ni P, et al Antiepileptic drug treatment after an unprovoked first seizure: A decision analysis http://n.neurology.org/content/91/15/e1429.long. Neurology 2018;91(15):e1429–e1439. •. Jacobs CS, Lee JW. Editorial: Immediate vs delayed treatment of first unprovoked seizure http://n.neurology.org/content/early/2018/09/12/WNL.0000000000006304. Neurology 2018;91(15):684–685. •. Krumholz A, Wiebe S, Gronseth GS, et al Evidence-based guideline: Management of an unprovoked first seizures in adults. Report of the Guideline Development Subcommittee of the American Academy of Neurology and the American Epilepsy Society http://n.neurology.org/content/84/16/1705.long. Neurology 2015; 84(16):1705–1713. 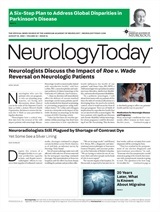 Neurology Today18(22):52-54, November 15, 2018.